Cloned from Voxelstorm Regular 01 by Frodo7. See also Voxelstorm Dingbats by Frodo7, Voxelstorm Mini 02 by Frodo7. Clone of Voxelstorm Regular 01. Info: Created on 14th April 2013 . Last edited on 27th July 2015. The complexity of some letters is incredible. 3D taken to new heights, Escher would be impressed I'm sure. It deserves a tp for ingeniuity of thought and design and another one for actually creating it in the grid. Soon after finishing the VS Mini series I thought about making an even smaller/shorter version. 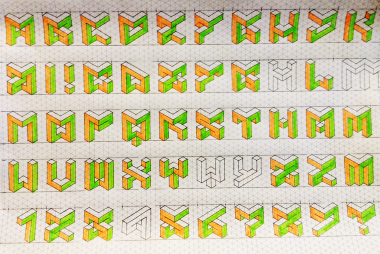 This was a real challenge, to make all glyphs legible, as I squeezed them into the smaller frame. I've made the sketches on paper, made a clone of Voxelstorm Mini 02, named it Nano 02, but never actually built them in FS until recently. See the original paper version below. Congratulations! FontStruct Staff have deemed your FontStruction worthy of special mention. “Voxelstorm Nano 02” is now a Top Pick. As always a brilliant concept - executed in exquisite detail. Words never suffice when they face such brilliance. Nice. Looks like a Chibi version of the regular Voxelstorm. The whole Voxelstorm family is incredible. Awesome work! @meek: Thank you very much for the special mention. @p2pnut, geneus1, laynecon: Thank you for your kind comments. All your feedback is much appreciated, and keeps me going. The inscription over the doors of Durin, containing the password to open it. That sample looks great and really shows off the font! Great work, love the gradients in the sample. Interesting to see the original sketches too. @LexKominek, and ad777: Thank you for your comments and ratings. @Yautja: Sketches: I always start with pencil and paper. (The only exceptions are pixel fonts, which are easier to experiment with in Fontstruct.) Sharing the original sketches could benefit aspiring fontstructors in many ways. It is like inviting them to my workshop. I'd like to see more sketches, behind the scene pictures, myself. In fact, there is a good book on showing sketches only: Typography Sketchbooks by Steven Heller et al. (2012), Thames & Hudson. 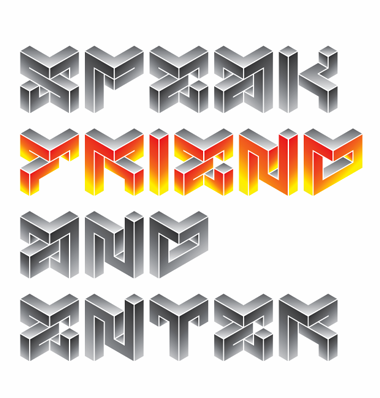 The sample with gradients was done in Adobe Illustrator, manually editing the letters. Once I completed the character set, I'm going to make a layered version to make things easier for graphics designers. Beautiful work. Love how the compressed letterforms fold in on themselves, only leaving visible counters on a few glyphs. WHOA! I am so impressed!! !